In Albania, the climate is Mediterranean on the coast (with mild, rainy winters and hot, sunny summers), while it's slightly more continental in the interior, though it's really cold only in mountain areas. In the capital, Tirana, which is located about 30 kilometers (20 miles) from the coast, the climate is similar to that of Rome, Italy, even though the rains are more abundant in the period from October to June. Winter is mild and rainy, but sometimes at night it can get cold, while summer is hot and sunny, with some very hot days. The average daily temperature in January is 6.5 °C (44 °F), while in July and August it is about 24.5 °C (76 °F). Here are the average temperatures of Tirana. Along the coast, the climate is milder, with less chance of cold nights in winter and more effective afternoon breezes in summer. In the cities located around sea level but farther from the sea, or those sheltered by mountain ranges (such as Shkodër), the climate is slightly more continental, that is, a bit colder in winter, with January averages around 5 °C (41 °F), and hotter in summer, with highs often around 35 °C (95 °F). Moving inland, and with increasing altitude, the climate becomes much harsher, with cold and snowy winters, and progressively cooler summers. For instance, in Korçë, located in the east, 900 meters (2,950 feet) above sea level, the average temperature ranges from a low of 0.5 °C (33 °F) in January to a high of 21 °C (70 °F) in August. The rainfall is plentiful along the coast, and even heavier in hilly and mountainous slopes facing west and south, so much so that it often exceeds 2,000 millimeters (78 inches) per year. Along the coast and in the plain, the rainfall regime is Mediterranean, with a maximum between autumn and winter and a minimum in summer, when it seldom rains. On the other hand, in mountainous areas, during summer there can be some thunderstorms in the afternoon. Here is the average precipitation in Tirana. The only sheltered areas, where it does not rain that much, are the inland valleys, such as that of Korçë, where 805 millimeters (32 inches) of rain fall each year on average. Here is the average precipitation in Korçë. In Albania, the sun shines regularly in summer, especially in the plain and along the coast, while in the other seasons there may be sunny days, but also cloudy and rainy days. The temperature of the sea is still a little cool for swimming in June, while it becomes acceptable or pleasantly warm from July to September. Here is the average water temperature in Durrës. The best time to go to the Albanian coast for a beach holiday is summer: in July and August, the sun always shines and the Adriatic sea is warm. 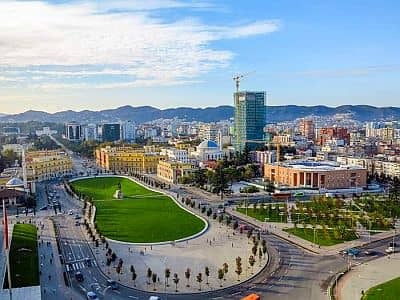 If you want to visit the cities of the plains, such as Tirana or Shkodër, considering that they can be hot in summer, you can choose the months of May, June, and September. October has pleasant temperatures too, but it can be quite rainy, especially in the second part. September, a month when the sea is slightly warmer than in June, may therefore be an interesting choice, to take a trip throughout the country and at the same time to spend some time at the beach. In winter: bring warm clothes, a coat, and a raincoat or umbrella. In mountainous areas: warm clothes, such as a down jacket, a hat, gloves, a scarf. In summer: bring light clothes, a sweatshirt or sweater for the evening or for the mountains.